A statement of style and sophistication, For Him Blue Noir is inspired by Narciso Rodriguez’s love for the intensity of a colour blue so dark, it appears close to black. Focusing on the mysterious but endearing colour of midnight blue, each fragrance pays homage to sensuality of this shade with a signature musc heart note accentuated by wild woods from the base. 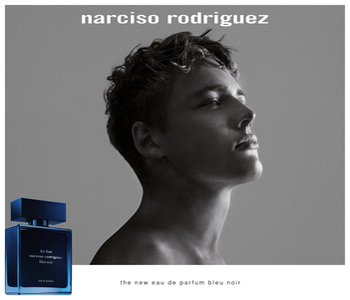 Clean, sharp and elegant, Narciso Rodriguez For Him Bleu Noir is a signature for a man of extreme depth.